Winner of the 2014 Utility Analytics Institute Innovation Award, the E3 IDSM model assesses the market potential and economics of distributed energy resources (DER) technologies for electric utilities. 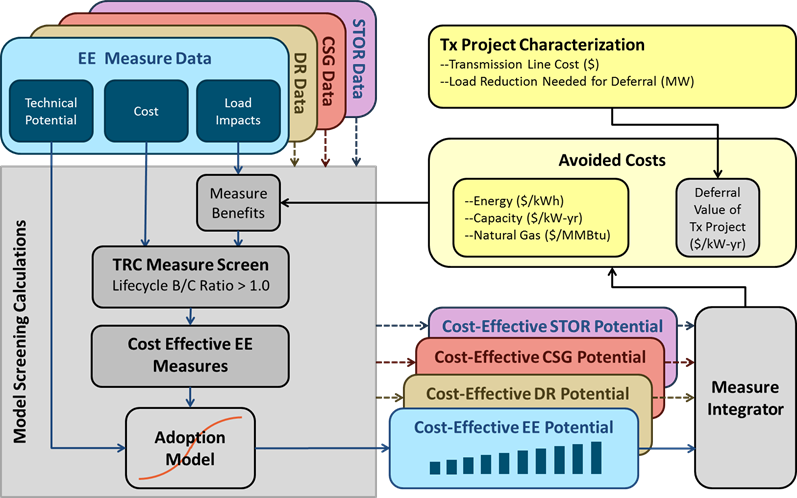 The IDSM tool identifies local market potential for each DER technology type for the study area, and then selects the least-cost portfolios that integrate DERs and meet utility reliability criteria. The tool’s algorithm dispatches DER technologies for input rate designs or market prices. It evaluates a full range of potential life-cycle benefits, including avoided bulk system capacity, energy, transmission capacity, distribution capacity, ancillary services, air emissions, and environmental externalities. Customizing the IDSM tool allows it to match existing program designs and provides results for cost-effectiveness for all standard-practice manual cost tests that regulators request. We have customized the tool for many utilities throughout North America, including Con Edison, Pacific Gas and Electric Company, and Bonneville Power Administration. For Con Edison, we customized the IDSM tool for its efforts to integrate DER resources into distribution planning for system network areas. For Bonneville Power Administration, we developed a version of the IDSM tool to evaluate potential non-wires solutions to their planned transmission expansion projects. For investor-owned utilities in California, we customized one of the IDSM modules for their own use, to compute local hourly avoided costs and load reduction requirements. The utilities (Pacific Gas and Electric, Southern California Edison, and San Diego Gas & Electric) publicly released this customized version to perform local net benefit analysis for the California Public Utilities Commission’s Distributed Resource Planning proceeding. With a focus on system and cost management, along with the growth in DER technology and associated customer strategies, Con Edison uses the IDSM model to develop cost-saving integrated solutions for their numerous electric subnetworks. IDSM identifies local market potential and economics of distributed energy resources to support system planning. For more information about IDSM, contact Snuller Price or Brian Horii.